On Monday, Vermont Sen. Bernie Sanders said that in the near future, he would deliver a major speech outlining his brand of democratic socialism. His announcement comes a week after the Democratic debate, when Sanders publicly (but not for the first time) declared himself a democratic socialist, leading many viewers to search the Internet to learn what that actually means. He said he has not yet selected a date for the speech, but told the Associated Press he wants it to happen "fairly soon." This is a smart move for Sanders, who has faced this question repeatedly in his campaign for presidency. Despite popular misconceptions about his political philosophy, democratic socialism really is not that radical at all. Based on the policies outlined on Sanders' website, many progressive American voters would probably support most of his proposals. During the Democratic debate, CNN's Anderson Cooper asked Sanders directly if a socialist could ever be elected president. Sanders began to clarify his ideology in response. "What democratic socialism is about is saying that it is immoral and wrong that the top one-tenth of one percent in this country own almost as much wealth as the bottom 90 percent. That it is wrong, today, in a rigged economy, that 57 percent of all new income is going to the top one percent." Cooper then pushed back, asking Sanders what he meant when he stated he is not a capitalist. 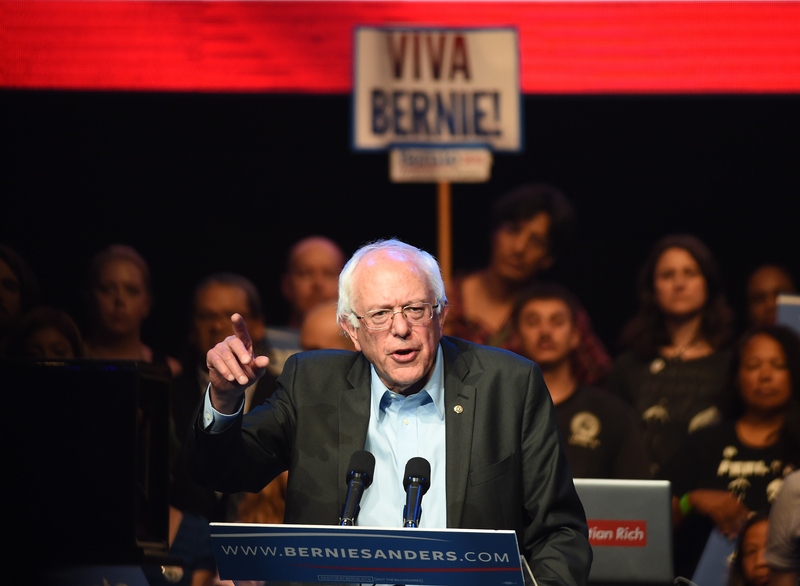 "Of course, we have to support small and medium-sized businesses," Sanders said. "But you can have all of the growth that you want and it doesn't mean anything if all of the new income and wealth is going to the top one percent." It is crucial to first understand the difference between general socialism and democratic socialism. In the eyes of right-wingers, socialism means big government, high taxes, and free handouts to the poor. Democratic socialism, however, happens simply when a democracy embraces legislation that supports the poor and middle classes. Unlike in totalitarian countries, the democratic process is upheld and protected. Sanders does not want to replace our democratic government with that of a socialist country á là the Soviet Union. Nor does he want to demolish the capitalist system and replace it with a state-controlled economy. The Sanders brand of democratic socialism means an increase in social security, health care, maternity leave, free college tuition, and other federal programs. Based on his policy views outlined on his website, his upcoming speech will probably confirm this. Wealth inequality must be addressed in democratic socialism, it is true. In his speeches and on his campaign website, Sanders has repeatedly said the greatest danger to American livelihood is the growing gap between the rich and the poor. Sanders believes that laws passed in the 1980s allowed wealth disparity to grow, rewarding the rich with tax breaks and making it harder for lower-income Americans to accumulate wealth. Even after the 2008 recession, little has been done to redistribute wealth from the major banks and other high-profit industries. "There is something profoundly wrong when 58 percent of all new income since the Wall Street crash has gone to the top one percent," Sanders wrote on his campaign page. Millennials are already comfortable with Sanders' socialism, and understandably so. According to a YouGov poll, 36 percent of young people are in favor of socialism, versus only 15 percent of those 65+. For those born after the end of the Cold War, the term "socialist" does not carry the stigma it did in the McCarthy era. We've seen democratic socialist countries in Europe extend benefits for their citizens through welfare programs in the past 50 years. Like it or not, studies associate better welfare with a higher quality of life. Denmark, Sweden, and Norway — all countries with extensive democratic socialist policies — ranked high in the index of happiest countries in 2014. Despite its bad press, democratic socialism is not as radical as many believe. Older Americans may support Sanders' policies too, even if they don't like the word "socialist." Among the many policy changes outlined on his website, Sanders wants to break up the giant financial institutions that have grown "too big to fail," as he puts it. He wants to overturn the Citizen's United decision and keep billionaires from influencing elections. He advocates legislation that creates jobs for Americans of all ages, not just young people. Although there are countless policy changes a democratic socialist could support, in his upcoming speech, Sanders is likely to highlight the same hot-button issues he mentioned during the Democratic debate: rewarding businesses that grant maternity leave, reducing college tuition or making it free, and limiting corporate greed through federal restrictions. Anyone who thinks Sanders is a radical communist simply isn't reading his stance on this issues. Hopefully, this speech will enlighten them.